Most "do good" organizations depends on Government Funding, grants, or corporate funding to some degree. How can they express their real opinion without killing the goose that lays the Strontium Egg? So ya think they might be trying to say "we know" without directly losing their funding? Kind of a Mark Twain trick, right? Look how they named the Seals they took in for care...a vast majority are "radioactive names", with a few common elements, and a few musical stars. These are some of the names given to the rescued seals by the marine mammal rescue in Vancouver. I am not kidding. They also use some Band names, and some common elements. UPDATE JUNE 2015, it seems very odd, they used to have only 1 patient for this year, now they have 4, but look at the whole list in the link below for 2014 it is huge, so did they just give up? stock out, spread the word. Even as a pawn in this chess game, you can simply by your own choice take a "walk on part in the war". Joust on. 1) As a man concerned about our planetary health. 2) As one whom bases decisions upon concrete fact(s). 3) As willing to do the legwork to gather data where missing or incomplete from the academic world where feasible. 4) As a genuine source of reliable information. 5) As someone i have respect and admiration for. Stock - never over, never out, and ever reliable. What an article. Truth really is stranger than fiction! Disclaimer: i have no financial ties to this or any other organization. Tax that MoeFoe's! Take your fiat money and shove it! (DOA) - i hope that is named for the band DOA. D'oh. That one is deceased. Caesium is listed as onsite though. I wish there were a 2010 patient list, for comparison with our "Oilympic" year. Quote (by pic): "Springer (A73) swims beside her baby Spirit (A104)"
Quote: "Spirit (A104) - young whale of undetermined gender born in 2013"
... "Whale updates are available to active members of the BC Wild Killer Whale Adoption Program who have adopted a wild killer whale or made a donation to the program." I don't know that i would expect the whole truth out of Vanoc. Contrast that article with at least one enenews report. Quote from linked CBC article: ""The alarm bells are starting to ring because we have not had a successful calf born to this population of southern residents in almost 3 years. That's despite having 25 mature females that should be producing calves," says Peter Ross, the director of the Ocean Pollution Research Program at the Vancouver Aquarium." Ah. I see now. Those 77 remaining orcas are native to the Salish Sea. Spirit (A104) is noted as being a Northern Resident. Quote: "In July 2013, Springer was sighted with a calf, named A104, measuring about 2.5 metres long." That brings me back to the article about baby killer whales making a splash. Quote: "Researchers are always looking for changes in populations, and you never know when you might spot a new calf." 2014 saw two new calves born to the southern resident killer whale community, L120 and J50. Both births were celebrated, as every new calf is a valuable addition to the critically endangered southern resident killer whale population. L120 was first spotted September 6, 2014, next to mother L86. Unfortunately, at only seven weeks old, L120 did not appear to be with L-pod after they were spotted in the Salish Sea, returning from a trip to open waters off Washington or British Columbia. A few short months later J50 appeared. First seen on December 30, 2014 and estimated to be 4-10 days old at that time, there is still debate as to who is the mother of this new calf. It was seen swimming alongside J16 and J36, who are mother and daughter and estimated to be 43 and 16 years old respectively. In early January, 2015 J50 was spotted actively rolling at the water’s surface and a conveniently timed photograph revealed J50 is female." There is a newborn whale in the Salish Sea after all, it would seem. That calf was born apparently 20 days after the original enenews article. 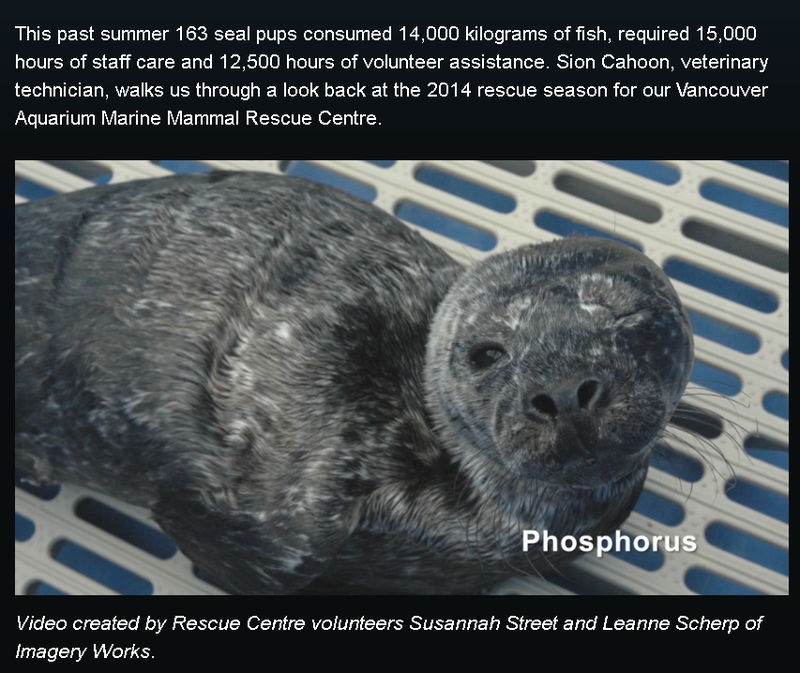 Quote: "This past summer 163 seal pups consumed 14,000 kilograms of fish, required 15,000 hours of staff care and 12,500 hours of volunteer assistance. 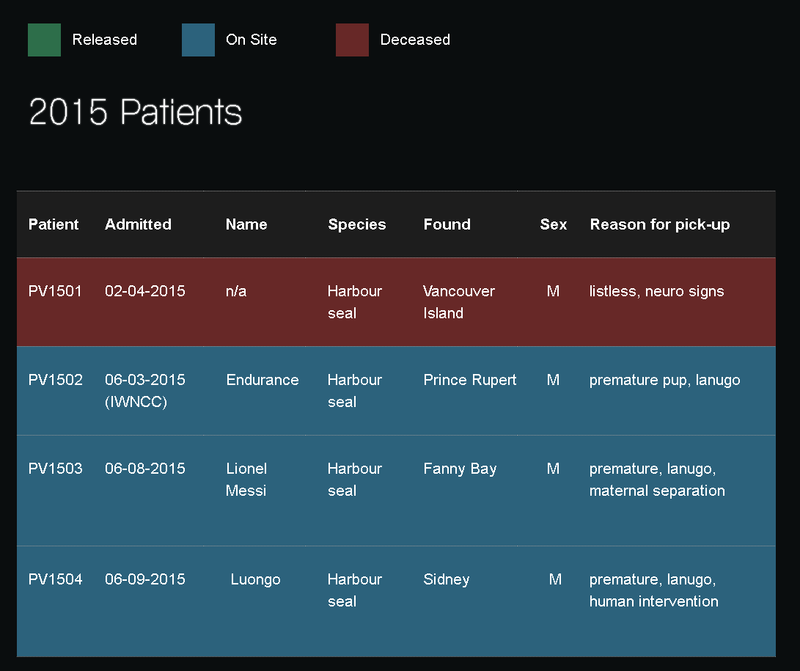 Sion Cahoon, veterinary technician, walks us through a look back at the 2014 rescue season for our Vancouver Aquarium Marine Mammal Rescue Centre." ... "Vancouver Aquarium’s Marine Mammal Rescue Centre, presented by Port Metro Vancouver and supported by Teekay Shipping, is a hospital for sick, injured or orphaned marine mammals. With a cost of $50 per day to care for each seal pup, donations are greatly appreciated." Would the Port Authority dare risk more bad publicity (after unemploying so many truckers that fought so hard for better wages) over names that might not be "politically correct"? I hope this time i have taken helps. Now i know more about what to tell my family, whom depend on me for timely and factual information free from even my own biases. Sheesh, i can board my dogs for cheaper than that, and they use volunteers for the seals also. Must be a part Gubmint program, lol. "Last year, cleanup volunteers removed almost 140,000 kg of litter." see "Canada’s Dirty Dozen List For B.C. Tsunami Debris Cleanup 2014"
Good work by the cleanup crews!